Will the hunters be able to stem the tide or darkness, or will Europe be consumed by the fury of Dracula? This is the original 1987 Games Workshop version, and probably holder of the crown for best Games Workshop boardgame. The Fury of Dracula drips atmosphere and plays beautifully—especially late at night. I have great memories of playing this one late at night with friends on the night of a full moon and by the light of flickering candles. 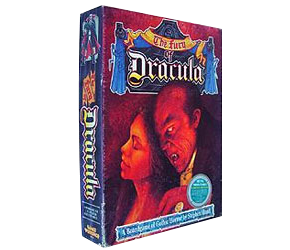 Fantasy Flight Games re-released this game as Fury of Dracula in 2006.